Naples attraction-guides.com - Naples, Italy attractions guide Naples Duomo di San Gennaro (San Gennaro Cathedral) information about attractions, landmarks, open hours, admission charges, Cattedrale Stefania, Basilica di Santa Restituta, frescoes by Domenichino, dome, location and address details, Via Duomo, Spaccanapoli, tel / telephone number, general tourist information about San Gennaro Cathedral in Naples (Napoli) area, Italy (Italia) IT - Last updated 30/10/2012. Naples' simply vast Duomo di San Gennaro is the city's cathedral and without doubt one of the most stunning attractions and landmarks in the whole of Naples. 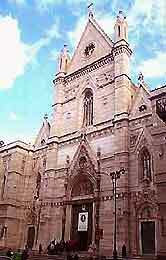 Constructed on the historic site of a previous cathedral, which dates back to 570 AD (the Cattedrale Stefania), the Duomo di San Gennaro (San Gennaro Cathedral) is located next to the Basilica di Santa Restituta, which was constructed in Naples during the 4th century. Over the years, the Naples Duomo di San Gennaro (San Gennaro Cathedral) has been both renovated and redesigned, particularly after much of it was destroyed by a large earthquake in mid-15th century. Attractions at the Duomo di San Gennaro include a gilt wooden ceiling (1621), golden roundels painted above the pillars depicting various saints, the Cappella del Tesoro di San Gennaro (Chapel of the Treasure of San Gennaro) built between 1608 and 1637, and many spectacular statues and frescoes. In 1620, the artist Domenichino was commissioned to paint many of the frescoes inside Naples' Duomo di San Gennaro (San Gennaro Cathedral) and had to paint under armed guard to protect him from jealous local Naples artists. Domenichino died in 1641 after suspected poisoning, before he had completed his work. The committee refused to use a Neapolitan painter after his suspicious death and the lavishly decorated dome was finally completed by the Roman Giovanni Lanfranco.